A Complete Wardrobe For An Entire Year! Includes Regular, Petite & Plus-size Shopping Sources! Your Closet Is Packed Full Of Clothes, But You “Have Nothing To Wear”. You have lots of clothes, but it’s difficult to find what you need to wear and get dressed on time. It Takes Too Much Time To Get Dressed Everyday. You find yourself changing clothes at least a couple of times until you find “the right outfit”. Unsure How To Look Polished And Put Together. You know there’s a better way to get dressed and look flawless. You’re tired of throwing away money on trends that won’t last. 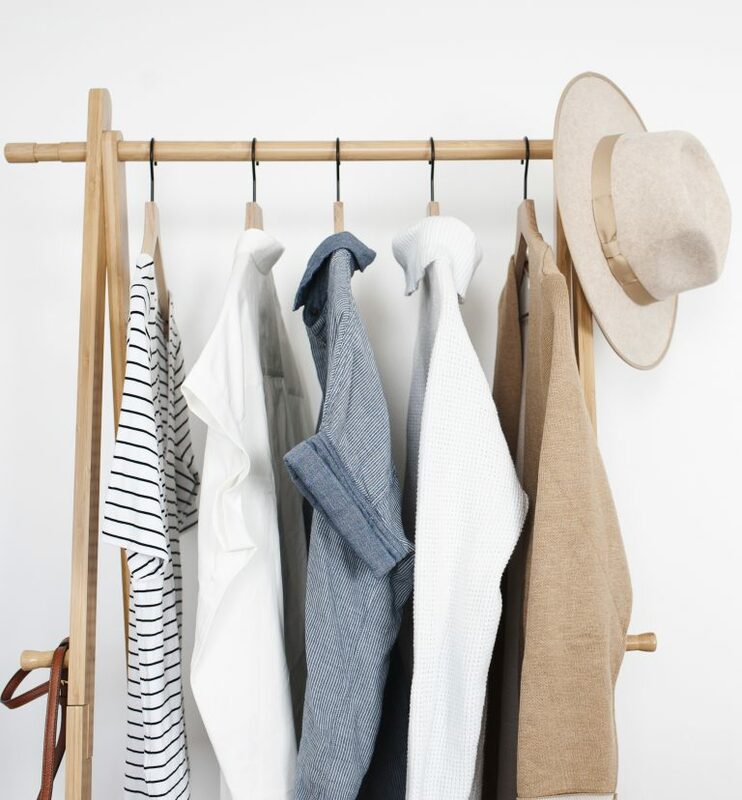 You want to have a wardrobe you will love to wear and is classic and timeless. Did You Raise Your Hand To Any (Or All) Of The Above? Good. WHAT IS THE “SIMPLIFIED STYLE” E-BOOK? “Thank you! LOVE THE e-BOOK! I’ve purchased a few others from you and now have most of the items in this one. It really does make getting ready easier. Keep up the good work! 😀 – Rhonda M.
I discovered your capsule guides earlier this year and this concept has made a huge difference in my life. Having the year-round layout is going to be awesome. I just wanted you to know how much you have blessed me these last few months and I look forward to another level of organization and feeling good about myself too! 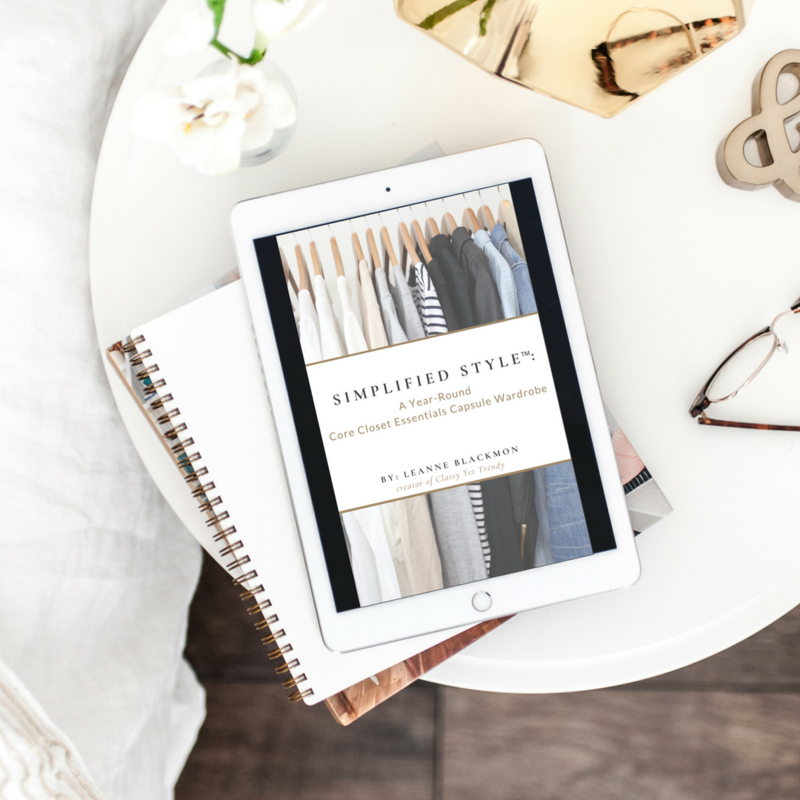 – Brenda V.
The Simplified Style Book is the best fashion investment I have ever made. I use it almost every night as I plan the next day’s outfit. And now that I have all the pieces, I don’t shop haphazardly anymore and that saves me so much money and buyer’s remorse! – Rhonda B.
I do buy some of the more colorful pieces from your other books to mix in, and I do appreciate that you make those available on your blog. 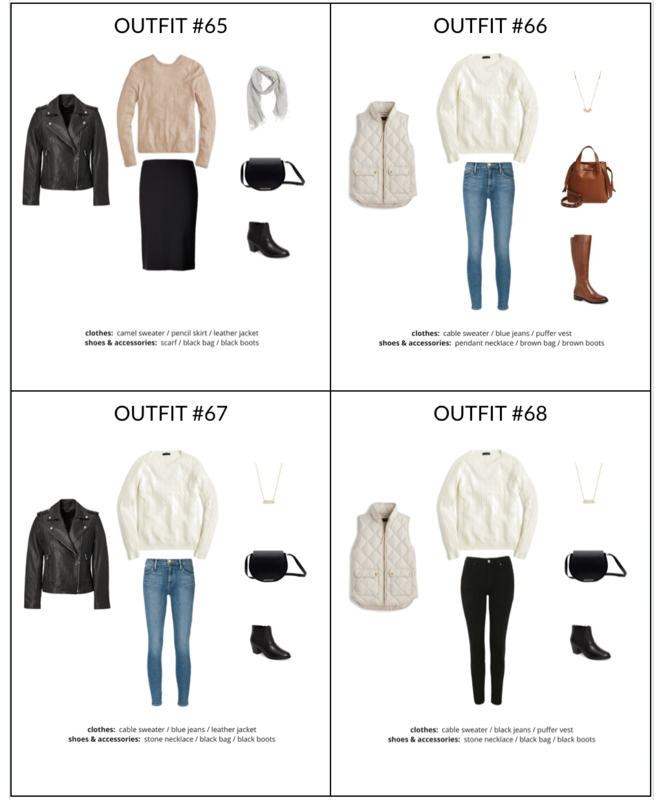 I absolutely love the Simplified Style Capsule eBook. I can easily adapt each outfit for my office job. I can also stop chasing trends and rest within my own style preferences. Thank you for making this possible! – Gina B.
I love this product! Its beauty is its simplicity. I have used it to create my own “career wardrobe.” As an elementary music teacher, I can’t wear jeans, but I have to sit on the floor all day. Most career capsules are not helpful! It was easy to sub in dress ankle pants for the jeans and nicer tops for the tee’s in the capsule. Of course, I use the casual outfits as well! 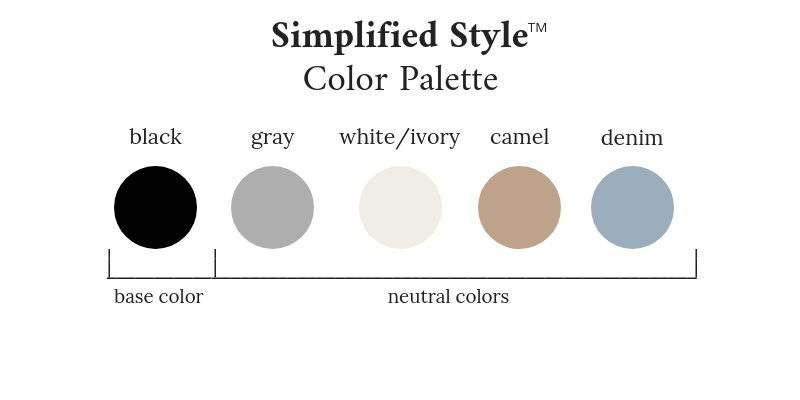 I especially love that since the capsule pieces are all neutral, I can keep all my “accent color” pieces rather than feeling like I have to go buy new ones. Thank you so much for a wonderful product! 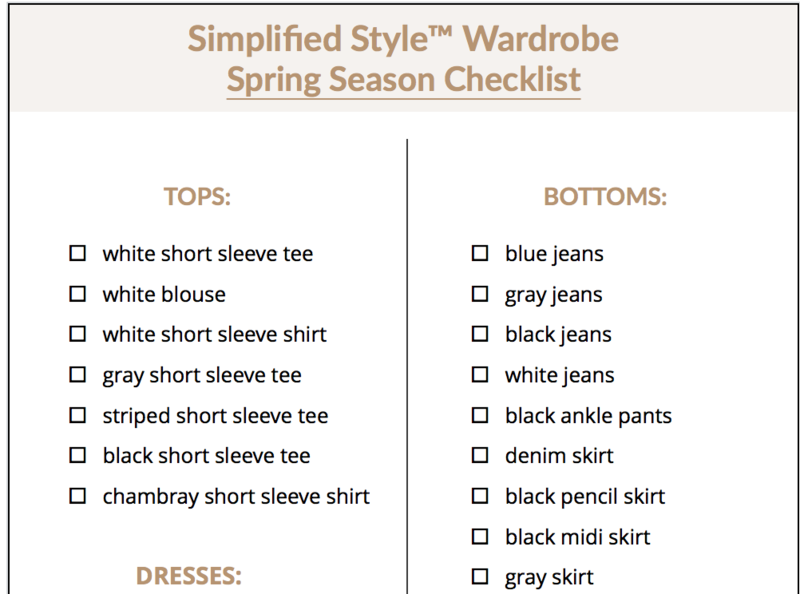 – Rhonda B.
I recently purchased Simplified Style e-book and I want to applaud you for including “Investment” choice options. This is what sets you apart from other capsule type blogs/vlogs/etc. 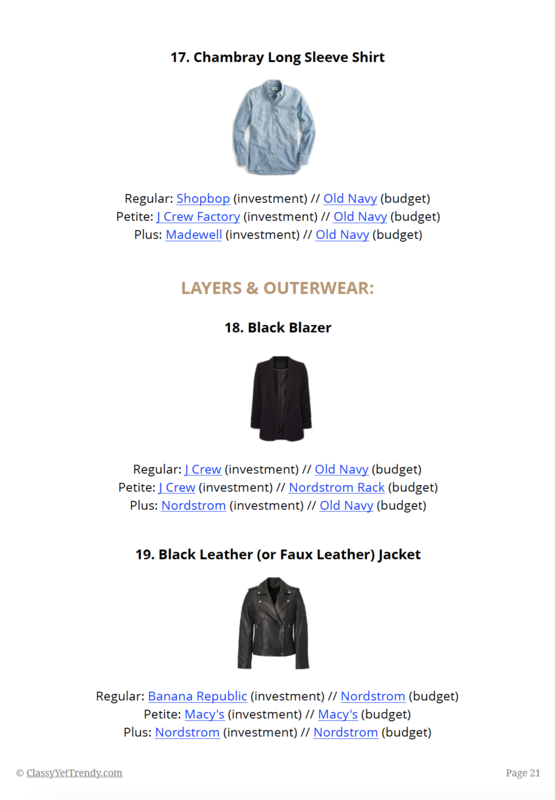 The Investment choices allow me to buy items I will wear for years, and look better while wearing them. My lifestyle needs clothes that are a bit more upscale. Thank you, Thank you, Thank you for including this option. I recently bought a cashmere turtleneck from Brooks Brothers (never in a million years would have thought to shop there) and am over the moon with the quality. I discovered your website/blog a few months ago and would like to thank you for teaching me so much. I am much more organized and have loved several of the items that I have purchased. I have also studied other ‘capsule’ type blog/vlogs and yours is the most comprehensive. 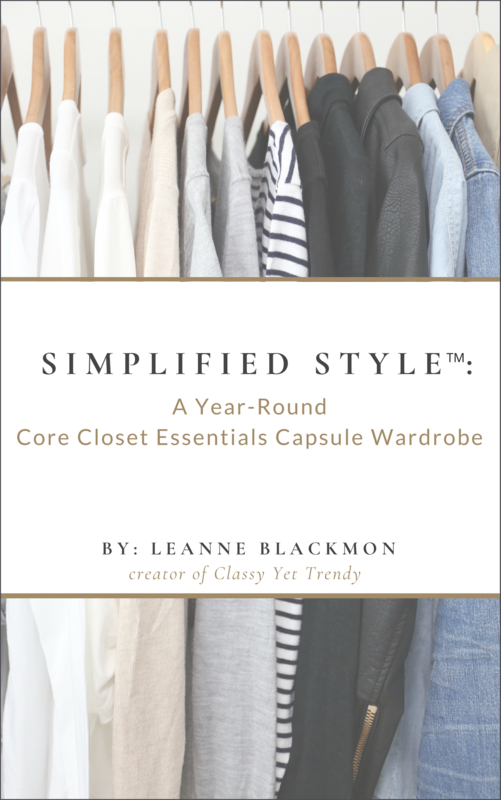 – Nancy N.
Thank you very much for putting together the Simplified Style capsule – it is just what I have been wanting! It is classic and versatile, with easy to find items at the price point that works in my budget. I can add my own personality in the accessories to make it my own. 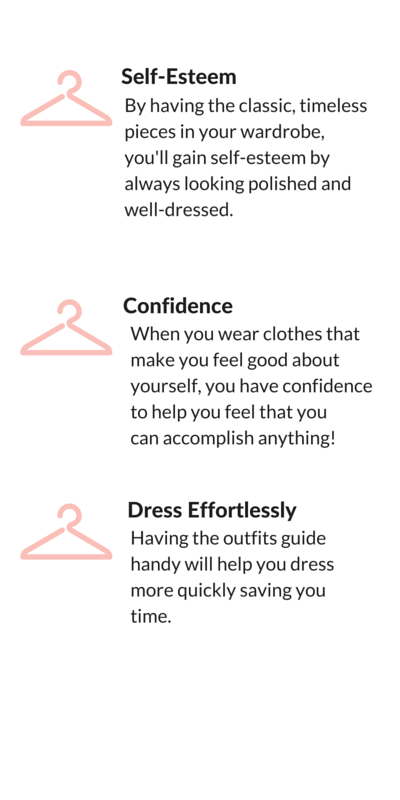 This will make my daily thought about what to wear much easier so that I can focus my energy on other things and feel confident that I am “put together” while going about my day. – Amy H.
I use Simplified Style but adjust my colors with the seasons similar to the essential ebooks. Looking forward to reaching a year of building my wardrobe. Just a few items to add then I can focus on replacing with quality pieces over time. I never would have known where to start without Leanne’s guidance! – Angela B.
Nope! These capsules include only basic essential pieces, most you may already have in your closet! For any pieces that you will need, I’ll share with you an online site where you can search for 1,000s of clothes, shoes and accessories at dozens of retailers! 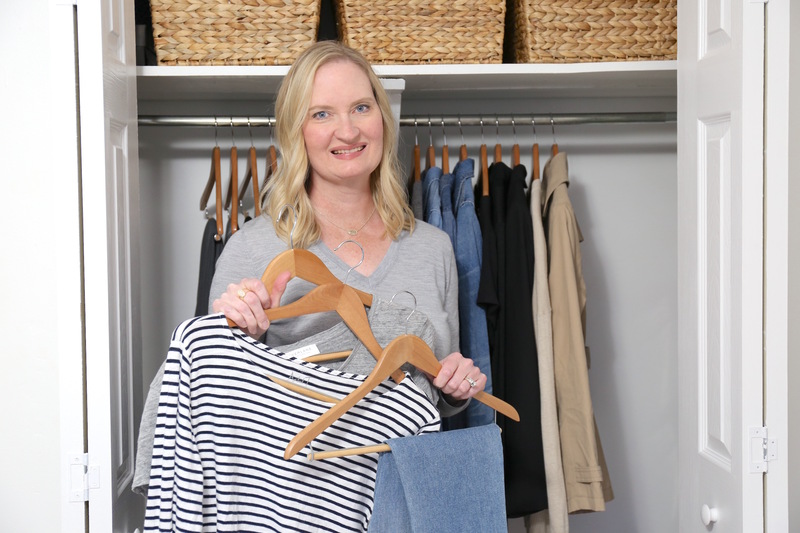 If you don’t have any of the pieces in the wardrobe and are on a budget, consider shopping for these at your local consignment shops, thrift stores, on poshmark.com or thredup.com. For each piece in the capsule, there are 2 shopping links each for Regular, Petite & Plus sizes. I refer only reliable sources such as J. Crew Factory, J. Crew, Loft, Madewell, Nordstrom, Old Navy, Target, etc. Regular-sizes range on average from 0 to 14/16 and Plus-size range from 14 to 24. Please check the item’s sizes available on the retailer’s site for each shopping link. Check with the shopping sources linked to see if they offer shipping to your location. SOME PRODUCTS IN THE CLOTHES, SHOES AND ACCESSORIES SHOPPING LINKS MAY NOT BE AVAILABLE OUTSIDE THE UNITED STATES. You may substitute for another similar piece. 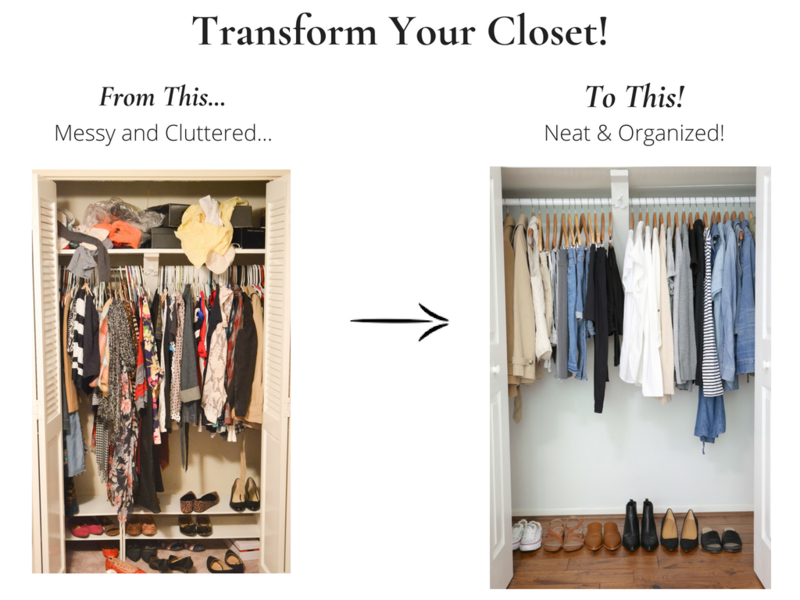 You can customize this wardrobe to fit your lifestyle! 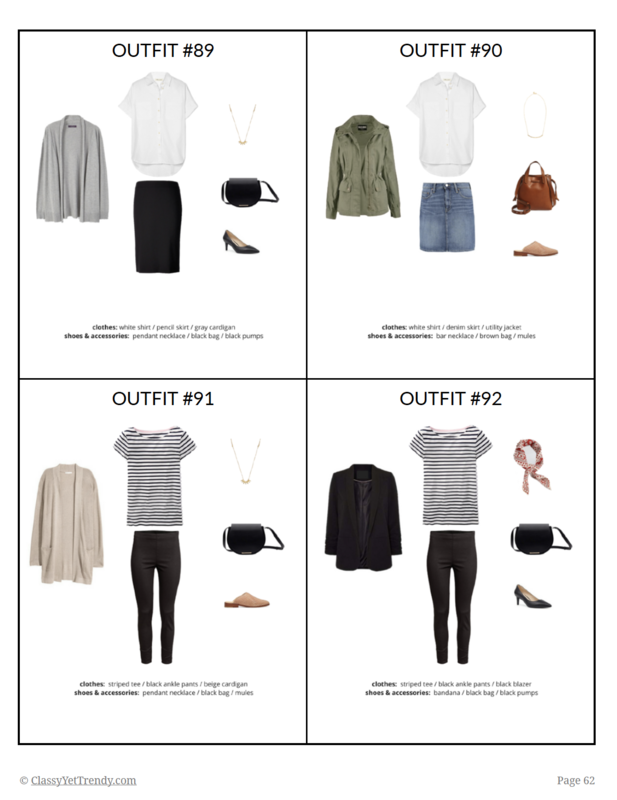 For example, you can substitute the black jeans for a pair of grey pants, white jeans for white pants, any of the shorts for more skirts, the possibilities are endless! If you would rather substitute clothes with a particular color in the capsule, you can omit those items and use another color in your capsule. You can use similar styles that you may already have in your closet. Once you pay for the e-book you will receive an email which contains your download link, so that you can download your e-book. If you don’t receive the email containing your download link, please contact me at classyyettrendy@gmail.com and I will make sure you receive your e-book! 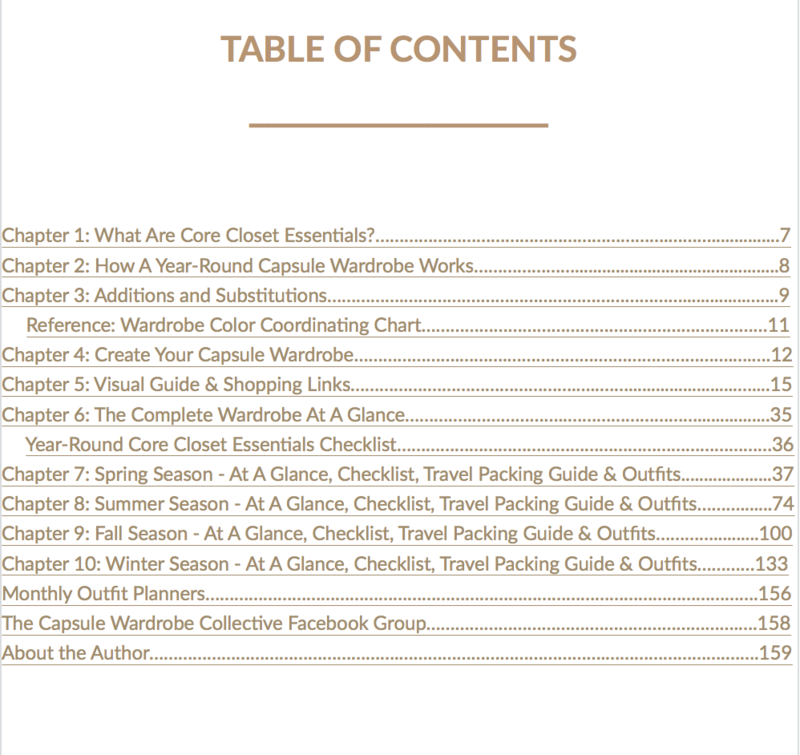 You will receive an eBook in digital format that is loaded with a step-by-step guide to show you how to create a capsule wardrobe, a guide of suggested clothes and shoes to include in your capsule, checklists, visual outfits guide, travel packing guides for all seasons and two monthly outfits planners. Sometimes retailers will sell out of a size in their products. This may be temporary or permanent. Unfortunately, this is beyond our control. We update this eBook periodically to refresh the shopping links. If this happens between updates, we recommend using shopstyle.com to search for alternate pieces.